How do I Activate/Manage my NetID? How do I Find my CWID Number? Open a web browser such as Firefox, Safari or Internet Explorer (Google Chrome is not supported). In the address bar type netid.montclair.edu and press Enter. The Montclair State NetID Account Form screen will appear. Faculty and staff registrations are completed on the right side of the screen. Enter your 8-digit Campus Wide Identifier (CWID) and your PIN number. If you do not know your CWID, you should refer to an email you received from your department. If you cannot find this email, contact HR at 973-655-5293 or hr@montclair.edu to retrieve your PIN. The next screen contains your personal information. If all of your personal information is correct, click on This Information is Correct to go to the next screen. If your information is not correct, click on the cancel and logout link, and contact Human Resources. Once you have verified your information and clicked on This Information is Correct, the New Password screen will appear. Enter a password in the New Password box, then re-type it exactly the same way to confirm the new password. Your password MUST be between 8 and 24 characters long, MUST contain at least 2 non-alphabetical characters, at least 3 alphabetical characters, at least 1 uppercase alphabetic character and at least 1 lowercase. NetID passwords are case-sensitive. After you have entered your password, click on Create my NetID Account. The next screen will appear with a message that your NetID account has been activated. Please take note of your NetID and keep your password in a safe place. To finish this process, make sure Logout is selected and click on the Continue button to exit the system. Once your NetID is activated, your email will be provisioned immediately. Other services may take up to 24 hours to be accessible. Navigate to netid.montclair.edu. On the right side of the screen, enter your 8-digit Campus Wide Identifier (CWID) and your PIN number. If you do not know your CWID, refer to the next section in this guide, How do I Find my CWID Number? The next screen asks you what you would like to do. 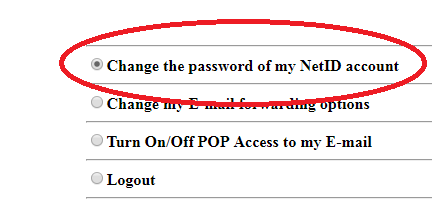 Please select “Change the password of my NetID account” radio button. Press Next and the New Password screen will appear. Enter a password in the New Password box, then re-type it exactly the same way to confirm the new password. Each NetID is linked to your personal information at the University. NetID password MUST be between 8 and 24 characters long, MUST contain at least 2 non-alphabetical characters, at least 3 alphabetical characters, at least 1 uppercase alphabetic character and at least 1 lowercase. NetID passwords are case-sensitive. After you have entered your password, click on “Change the password of my NetID account” button. Please take note of your NetID and keep your password in a safe place. To finish this process, make sure Logout radio button is selected and click on the Continue button to exit the system. Navigate to your account icon located on the top right and click on it. On the dropdown menu, click on View Profile. Your CWID is listed as your “Employee ID” on the Workday profile page. If you do not know your PIN, contact HR at 973-655-5293 or hr@montclair.edu. What is a faculty and staff Montclair State NetID? What can I do with my Montclair State NetID? Do I need a Montclair State NetID if I already have a mail.montclair.edu e-mail account? What if I don’t like the Montclair State NetID that was assigned to me? Can I choose a new one? My Montclair State NetID is spelled wrong! How do I get it fixed? Isn’t it a bad idea to have the same username and password for access to all systems? So what makes a password “strong” as opposed to “weak”? What is a Montclair State University NetID? A Montclair State NetID is your unique electronic identity that gives you access to a growing number of online services at the University. Your NetID is based on your last name plus one or more characters from your first name. Jane Cooper will have a NetID of cooperj. If there are faculty/staff members with the same name, the later hire will have additional letters added to their last name. For example, a new hire by the name of John Smith will have a netid of smithjo as opposed to the original smithj. Each Montclair State NetID has an associated password, so when accessing Montclair State University’s resources using your NetID you will also be required to enter your password. If you already have a @montclair.edu e-mail account, then you already have a NetID. Your NetID is the part of your e-mail address to the left of “@montclair.edu”. For example, a person with an e-mail address of “smithj@mail.montclair.edu” has a NetID of “smithj”. NetIDs are unique University identifiers that are based on your full name as it appears in the Workday databases, so they cannot be arbitrarily chosen. Individuals who legally change their name through marriage or other means can reapply for a new NetID provided the name change has already been updated in the Human Resources. The Montclair State NetID system relies on the Workday systems as the definitive source of all user data. Contact Human Resources and have your name corrected in the HR database. Once your name has been corrected at the source, you may reapply for a new NetID by contacting the IT Service Desk (973)-655-7971 opt 1. It is only a bad idea if you use a “weak” password that can be guessed, or cracked, easily. From a practical standpoint, having ten weak passwords is far worse than maintaining a single, strong password. You are much more inclined to choose a very strong password if it is the only password you need to remember. You are also less likely to write it down on a post-it note since it’s only one password, not a dozen different ones. It is important to realize that your NetID password is the key to your electronic identity at the University. It is crucial that you select a strong password and do NOT share it with anyone else or write it down. The golden rule is that a strong password should be easy for the owner to remember, but very difficult for anyone else to guess or discover. Montclair State University requires passwords to be between 8 and 24 characters long and contain at least two non-alphabetic characters and at least three alphabetic characters. At least one alphabetic character must be upper-case and at least one must be lower-case. The quotation mark, apostrophe, and space characters are not valid characters. Please note, NetID passwords are Case-Sensitive. zero for “O”, 3 for “E”, “$” for “S”, etc. Rule of thumb: NEVER, EVER use a word from the dictionary as your password, even if you reverse it and substitute a 3 for an “E”. Dictionary-based password cracking tools compare passwords against a large database of words and perform hundreds of combinations on each one to try to crack your password. The success rate of these cracking tools is surprisingly high. Please do not copy/paste and use the above passwords as passwords to any of your accounts. They are examples only and are publicly placed on this webpage.